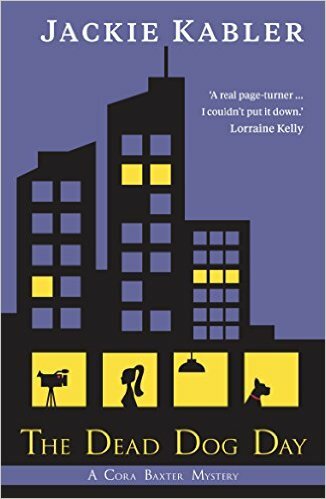 The Dead Dog Day is the debut novel from successful broadcaster and former GMTV reporter Jackie Kabler and it’s published today. It follows the story of breakfast TV journalist Cora Baxter, and a race against time to stop a killer from striking again. I’ve only had time to read the first few chapters so far but already I’m enjoying it. The author captures the frantic behind the scenes goings-on of a breakfast tv show when the star attraction, a hero St Bernard dog has inconveniently died before it was due to appear on-screen. The tyrant of a boss, Jeanette, is not happy and everyone is dreading her reaction. But by the end of chapter two she too is dead! There are already a few characters acting in a way which makes you think they may have something to do with her death….. I’m looking forward to reading the rest of the book. Jackie has kindly answered my Author in the Spotlight questions so read on to find out more about her. I must say as a born and bred Edinburgh citizen, I highly approve of her last answer! Happy to! I’m Anglo-Irish, live in glorious Gloucestershire and have been married to JJ, who is a GP, for 21 years. I switched from being a zoologist to being a journalist in my late twenties, first in newspapers and then in TV. I spent nearly a decade with breakfast television show GMTV as a roving reporter, then worked freelance all over the place, including for BBC and ITV news. Three years ago I quit the news business and joined shopping channel QVC as a presenter – I love it! I was spending so much time covering quite harrowing stories while at GMTV – murders, floods, fami‎nes, disasters – and I needed to escape from that. I’d loved writing since I’d been at school, and I had met so many quirky and interesting characters during my working life, so suddenly decided to start writing a novel based in a TV newsroom. I never thought it would be good enough to publish, but I loved writing it so much. The book originally started as more of a romantic comedy, but it wasn’t really working and there was no interest in it whatsoever when I sent it out to a few agents. Then I left GMTV to work freelance and life got even busier so the book was put away for about six years. When I joined QVC, where I work four days a week, I decided to get it out again, and rewrite it as a murder mystery. This time when I started sending it out I got several rejections but then a sudden flurry of interest, until one crazy day when I suddenly had an agent and three publishing deals on offer. I accepted a three-book deal with the fabulous Accent Press, for a series of murder mysteries featuring the same characters. It was one of the most exciting days of my life! My debut The Dead Dog Day is set in a breakfast TV newsroom. Reporter Cora Baxter’s boss is murdered and she ends up getting dragged into the investigation in unexpected ways. It’s essentially a murder mystery but there’s humour and romance in there too. Yes, I’m working on book two of The Cora Baxter Mysteries. It’s called The Deadline, and it has to be finished by April. It’s going to have to be three! I adored I Let You Go by Clare Mackintosh, The Lie by C L Taylor and The Little Flower Shop by the Sea by Ali McNamara. I’m reading The Coroner by M R Hall. It’s a great story about the really interesting work of a coroner but I also like it because it’s set in the West Country where I live. Book so far, although ‎my husband is getting me a Kindle for Christmas. I’ll still read real books at home but use the Kindle for holidays – I’ve been known to take up to eleven books on a two week holiday which doesn’t leave much room in the suitcase for clothes! If I’m at home, I read every night in bed; if on holiday, all day if I’m allowed to! I’m on Twitter on @jackiekabler, have a Facebook author page at http://www.facebook.com/jackiekablerauthor and I have a blog on the http://www.qvcuk.com website – click on Meet the Presenters. I’d quite like to be ‎Ian Rankin’s Detective Inspector John Rebus. He’s a great character, I love Edinburgh where he’s based and I think I’d have enjoyed being a detective!